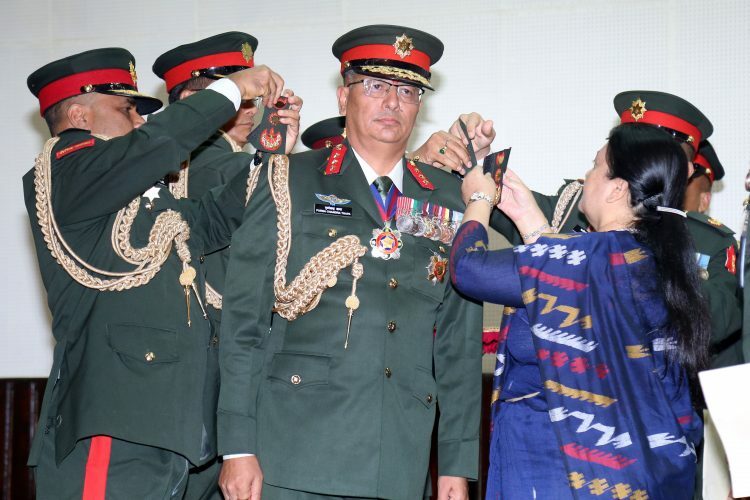 Kathmandu – President Bidya Devi Bhandari on Sunday appointed Purna Chandra Thapa as the new Chief of Army Staff on the recommendation of the Council of Ministers. The President, who is the Supreme Commander-in-Chief of the Nepal Army, administered the oath of office and secrecy to Thapa amidst a function held at the President’s Office, Sheetal Niwas today. Vice President Nanda Bahadur Pun, Prime Minister KP Sharma Oli, Deputy Prime Minister and Minister for Defence Ishwar Pokharel, Ministers, chiefs of constitutional bodies, high level government officials, among others, were present on the occasion. The Cabinet on August 9 had recommended Thapa to the post. Gen Thapa succeeded Rajendra Chhetri, who completed his tenure as the chief of the national army today itself. After taking the oath of office, Gen Thapa assumed office as the 43rd CoAS. Born in 1960 in Lamjung, he had joined the Nepal Army in 1979.